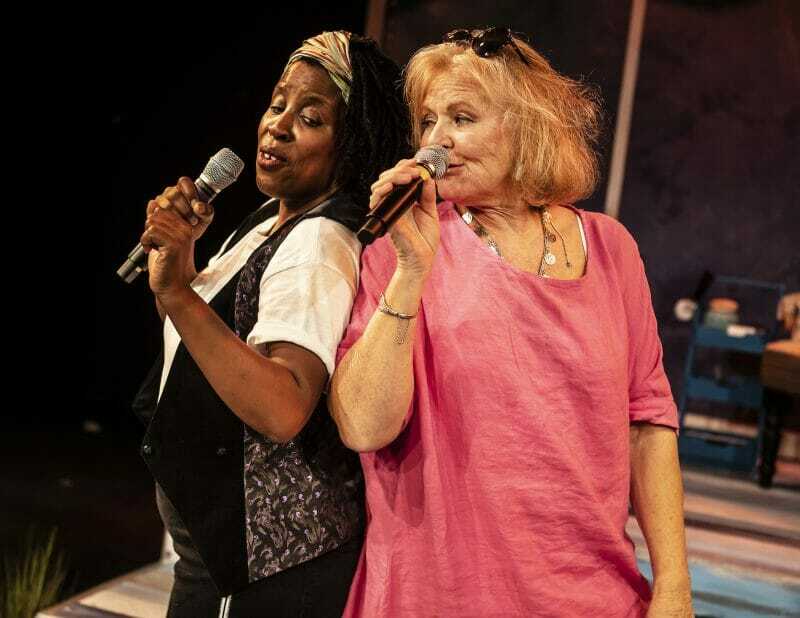 Having already played off Broadway at the York Theatre, Bill Russell and Janet Hood’s Unexpected Joy makes its planned transfer to London and the Southwark Playhouse. With the same director but different cast, it immediately feels like this all female line up are capable of delivering something really special. 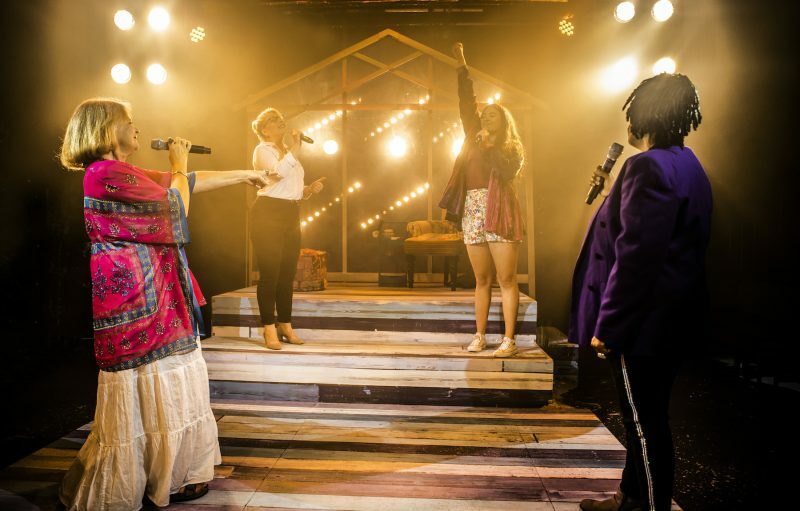 Its part concert and part play, with the title character hosting a memorial gig for her dearly departed partner both on and off stage, Jump (Jump & Joy). She’s also planned her wedding to “lesbian warrior” Lou for the very next day, assuming it’ll be more convenient for her daughter and granddaughter who are in town for the concert anyway, she just needs to pluck up the courage to tell them she’s marrying a woman. That’s problematic, because semi-estranged daughter Rachel (born Rainbow) has rebelled against her parent’s pot-smoking, free and easy lifestyle and married a TV evangelist, who of course condemns homosexuality, and is also dealing with her own daughter, Tamara’s rebellion against a conservative lifestyle. It’s a pretty solid starting point plot wise, but Unexpected Joy fails to really make the most of the opportunity it has. Yes, it’s wildly funny at times but much like a sitcom every line feels like a set-up for the next joke, and that in turn over shadows any potential to really pull on the heart strings. The songs, which are cued up almost as obviously as the jokes, are all enjoyable an ensemble number, ‘What a Woman Can Do’ is probably the stand out of the night, for both its powerful sound and message, there’s a nice mix in the musical genre’s and they sound great under the musical direction of Gareth Bretherton. The cast do a good job, each of them fitting nicely in to the stereotypical character they’ve been given. 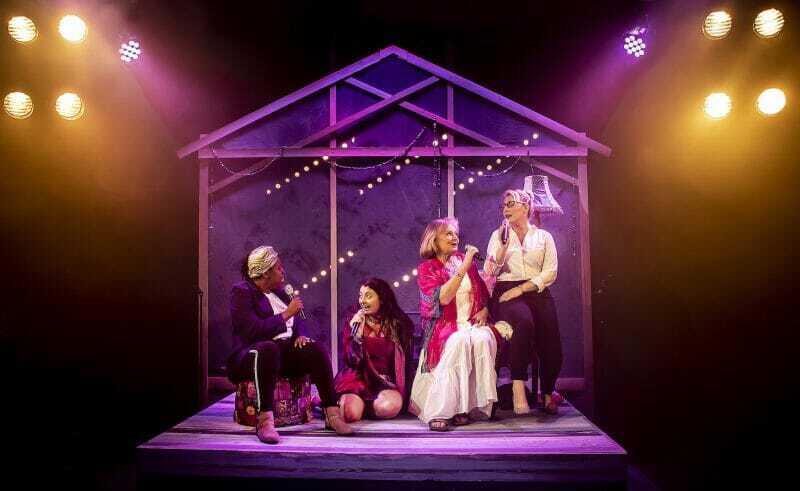 Vocally they all sound wonderful, Kelly Sweeney as Tamara gets a chance to rock out with ‘Like a Good Girl’ while Jodie Jacobs as Rachel laments reflectively with ‘Raising Them Right’. 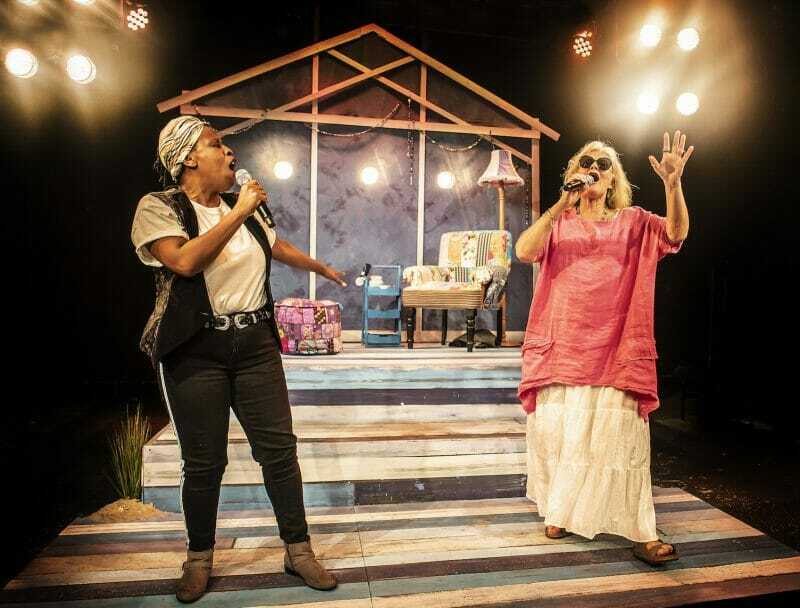 Melanie Marshall’s Lou not only has the best lines, but also some of the best songs, including ‘She’s Got a Mind of Her Own’, while Janet Fullerlove heads the cast as suitably hippy-ish Joy, with a natural talent for comic timing. 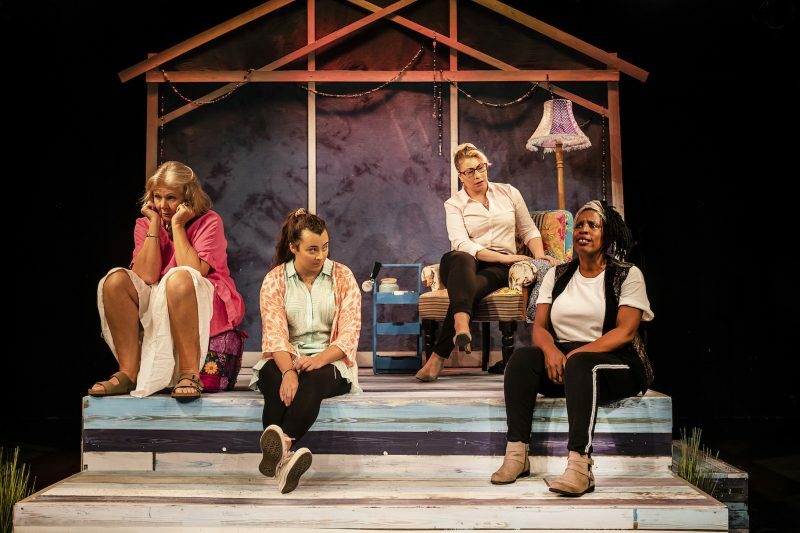 Director Amy Anders Corcoran gives everyone a chance to shine, and there’s a very homely feel to the set, which brings Massachusetts’ Provincetown to Southwark. 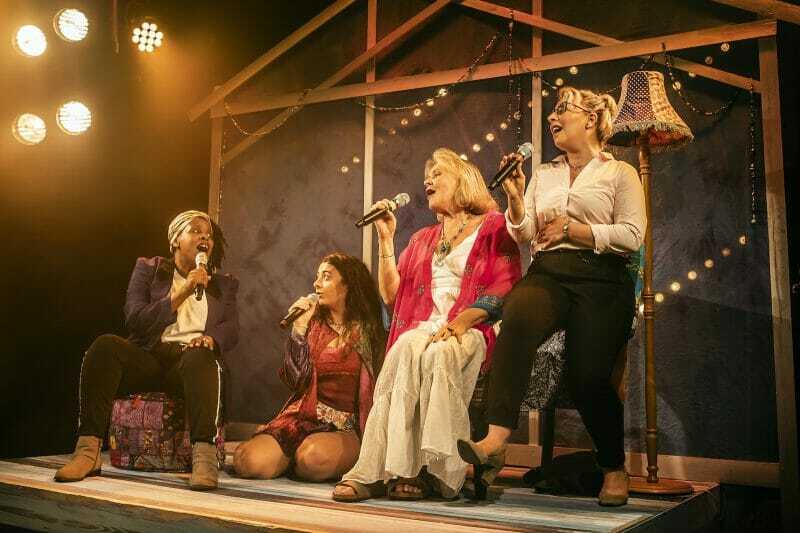 There’s nothing particularly unexpected about Unexpected Joy, but for all its predictability and reliance on stereotypes, it’s a well-intentioned musical with a positive message and an entertaining score.